Laptop Virus Removal can be required in the event that your laptop slowed to a crawl and it restarts randomly. Additionally, it shows a blue screen and popups alternatively, has fake anti-virus software or your home page has changed. In either case, it means your laptop is infected with a virus or spyware. When your Laptop is infected by a virus, you are at risk of losing confidential data such bank login info, credit card data, site passwords as well as other documents. Don't panic, we can remove your virus or spyware from your laptop without losing any of your valuable data. We will obviously recommend and install anti virus and spyware software to ward off future attacks. Removing a virus, trojan, or spyware from a laptop is time consuming and not easy job. It may result in loss of data if not done correctly. 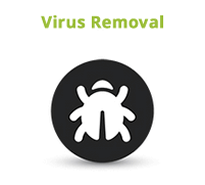 Our technicians take extensive care when removing virus and spyware from our customer's laptop. When necessary, all data of your data is backed up first before virus removal work is carried out. We are a true nationwide provider of Laptop Virus cleaning , Laptop professional repair services as well as iPhone repair. Besides repairs at our Laptop virus services, Laptop repair, PC Computers and laptop repair service center in Bellville Cape town, we have removed viruses for customers all over South Africa including Johannesburg, Pretoria, Durban, Kimberly, Bloemfontein, Port Elizabeth, Polokwane, Pietermaritzburg and Nelspruit plus many other South African cities. If you would like to use our professional Virus Removal services but don't live close to our Laptop repair service center, click here for information on sending us your iPad for professional repair through our express courier service. The time to remove a virus depends on the type of virus that your laptop has. It ranges from just a couple of hours to a few days. The service price includes removing all viruses and repairing damage to the operating system. It does not include virus protection software.